During my trip back home last Fall, we went to Kauai to hike the famous Na Pali Coast on the North Shore. The Kalalau Trail is 11-miles long and ends at the beautiful Kalalau Beach, which is only accessible with a permit by the hike or by boat. This is one of the most famous hikes in the world and I'm so glad we made it there and back safely! Crossing the infamous sea cliffs was the scariest moment of my life, to date. That being said, the Na Pali Coast is hands down the most beautiful place I've ever seen, and hence making every bit of the hike so worth it. I've been meaning to write this post for awhile. I thought about it this past weekend since it would be a great time to secure some permits before they're all gone. It's been about six months since I've done the hike, but I still remember every bit of it. Better late than never! I like to hike, but I haven't been in awhile so I was counting on my weightlifting and CrossFit experience to get me through. Since we were only able to get permits for one day, we were on a tight schedule: 1 day to Kalalau, camp, 1 day to hike back. I thought we would have ample time since we did Half Dome in one day and that hike was about 22 miles. On top of that, I didn't quite understand why 3-4 days was necessary to do the hike. Don't get me wrong, Kalalau was no walk in the park. It was significantly more difficult than Half Dome. Lots of uphill, downhill, switch backs, narrow trails, sea cliff hiking and stream/waterfall crossings in the hot sun... all while carrying a 20+ pound backpack. I was right to some extent about the timing since we managed to complete the hike in two days, explore Kalalau Beach and enjoy the sunset. Growing up on Oahu, I've seen many beautiful beaches. But the Na Pali Coast was GORGEOUS to a whole new level, and unfortunately, we didn't have enough time to truly enjoy all the beauty. Words can't even describe how stunning it was. Untouched, not littered, prehistoric, and so beautiful. As we got closer and closer to Kalalau Beach, all I could think of was I wish we had another couple days here. Slippers... trust me you want to bring some! Hiking boots. Invest in a good pair. Even though it didn't rain, there were many parts that were slippery and eroded. Water purifying tablets. 3L was enough for 1 day so I had to refill. I also had the Camelbak Water filter so my water didn't taste like the tablets. Lightweight blanket. I didn't need a sleeping bag. It was plenty warm during the night. Sunscreen and also lip balm with major SPF. You will burn. 100% Deet bug spray. Kalalau was full of bugs and since I'm every bug's favorite person, this was a must. Camera.. the heaviest item in my bag. We woke up at 4:30am on Saturday with hopes to start the trail no later than 6am. The drive from Princeville took much longer than we expected. When we arrived at the trail parking, we were happy to see plenty parking spots! The trail begins at Ke'e Beach at Haena State Park. We started the trail at about 6:45am and reached Kalalau beach almost 7 hours later, before 2pm. I would say one of those hours was spent crossing the sea cliff. We probably could have done the hike in 6 hours, if we didn't ice bath for so long at the stream, but that felt too great not to do. You don't have to hike very far to start seeing beautiful views of Ke'e Beach and a glimpse of the majestic Na Pali coast. The trail is easy to follow and no problem in the dark with a headlamp. A beautiful view of Ke'e beach during the day. Me + Ke'e beach early in the morning. 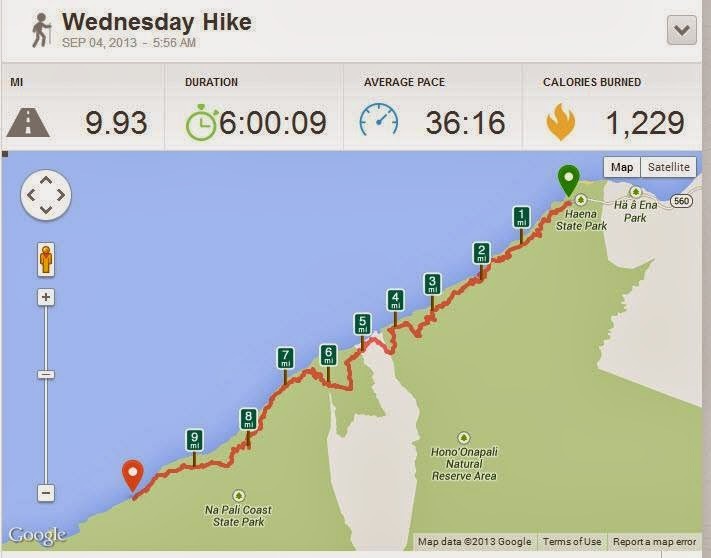 The first two miles will take you to Hanakapi'ai Beach and trail to the falls: 1 mile uphill, 1 mile downhill, but nothing too steep or strenuous. The trail is very well maintained and heavily used. In fact, it can easily be done in slippers and trust me you'll want to wear them especially on the way back! The hardest part is crossing the stream to continue the hike! Good thing it wasn't too crazy. We were able to keep our shoes on, no problem. View of Hanakapi'ai Beach after crossing the stream. Crazy trees near Hanakapi'ai beach. Hanakapi'ai Beach is one of the two sea level drops in the hike, the second being at Kalalau Beach. The next four miles will take you to the Hanakoa stream crossing. Hanakoa is a hanging valley without a beach. The hike became slightly more strenuous and the trail narrowed. We hiked through a series of switchbacks, up and downhill, and inland towards the stream. No more ocean breeze or view for awhile. Just when we began to think the hike is getting long, we were rewarded with a peak of the gorgeous Na Pali coast. Fired up again, we continued. Once you reach Hanakoa, there are campsites and bathrooms. There were also fresh mountain apples and guava trees. Yummm! A lot of people stop here and camp for one night. After the 6-mile mark, a permit is required. Occasional reminder of what you're hiking to. So pretty. Hiking inland towards the stream, in shade. and you're back in the open. Once again we didn't have to take off our shoes to cross the stream :). After the 6-mile mark, the hike became significantly more difficult as we began our journey to the infamous Na Pali cliffs. The trail became drier as we entered open land. I can only imagine how hot it gets mid-day! Also, a lot of uphill. That being said, the panoramic views of the coast became more and more breathtaking. For me, it was motivation to get to Kalalau! The trail before and after the cliffs were really narrow... and the trail on the edge of the cliff was even narrower than that. If you're scared of heights, you're not going to like mile 6.5 - 8. Crossing the cliff was hands down the scariest thing I've done to date. It's EXTREMELY narrow. You are literally on the edge and the drop off to the ocean is severe. There was also a lot of erosion. So every step we took, we slid a little bit. Scary. So wish we had hiking poles. Oh yeah, while I was worried for my life, there were mountain goats running up and down. Don't worry though, the way back was significantly easier. Some people like my dad and brother, didn't even notice crossing the cliff. It was cake for them. Narrow open trail leading up to the infamous exposed sea cliffs. This picture really doesn't do the cliffs justice. It was so much scarier than what's pictured! Or maybe it's just me. This picture was borrowed from Unreal Hawaii. It's a great photo, showing how narrow the cliff is. Unfortunately, I have no photos like this since I was scared out of my mind. Here's another good photo from Unreal Hawaii. I guess from this photo it looks like you have tons of space though it didn't feel that way. Any doubts you may have had about the hike leading up to the cliffs will quickly disappear once you see the view. We snapped a few photos and proceeded. Going downhill after crossing the sea cliffs was tough, and again, eroded. The hike didn't get much easier. Afterwards, we continued on the narrow open trail towards another series of switchbacks and more stream crossings. and we're back in the open.. absolutely stunning. and the view from behind. The trail was mostly open from here and the views just get better. So good, that this part of the hike went by quickly and in no time, we were at the Kalalau trail sign. This is probably around mile 9. What was weird was we didn't descend much leading up to the Kalalau sign, which is just shy of the 10-mile mark. After the sign, we hiked down Pu'ukulua (Red Hill) towards Kalalau stream. While descending we were rewarded with the most stunning, gorgeous views of Kalalau. Me + Kalalau beach. It was so beautiful I had to go Jap tourist style and snap a zillion photos. Once we reached Kalalau Stream, which is about 10 miles in, we saw a lot of people bathing or refilling water. This was the last big fresh waterfall and a perfect place to take an ice bath! This is where I so wish I brought my bathing suit! Regardless we stripped down, took off our shoes, refilled our water, ate, and hung out for a bit. My feet felt so awesome in the cold water! You can see people bathing in the back! Slippers after this point is no issue. After the stream, we hiked downhill to get to sea level and of course, Kalalau Beach. Along the trail are many campsites. We reached Kalalau Beach before 2pm. and to the last (small) waterfall. mm fresh water. Soon enough, we reached the gorgeous, untouched Kalalau Beach. You can keep walking towards the end of the beach (probably another mile) and see the sea caves. These sea caves were so much better than the ones off of the highway! After exploring the beach all afternoon, we hiked back to the stream to refill our water and take a second ice bath. Since a lot of the prime campsites on the beach were taken, we decided to camp near the stream. This would also cut down another 1-2 miles for the hike back. We pitched our tents up just before the sunset. After watching the sunset, we went to bed. Our plan was to start the hike back at 6am the next day. The hike back felt significantly longer and we had to take more frequent breaks. It was very hot and my feet began to get sore. 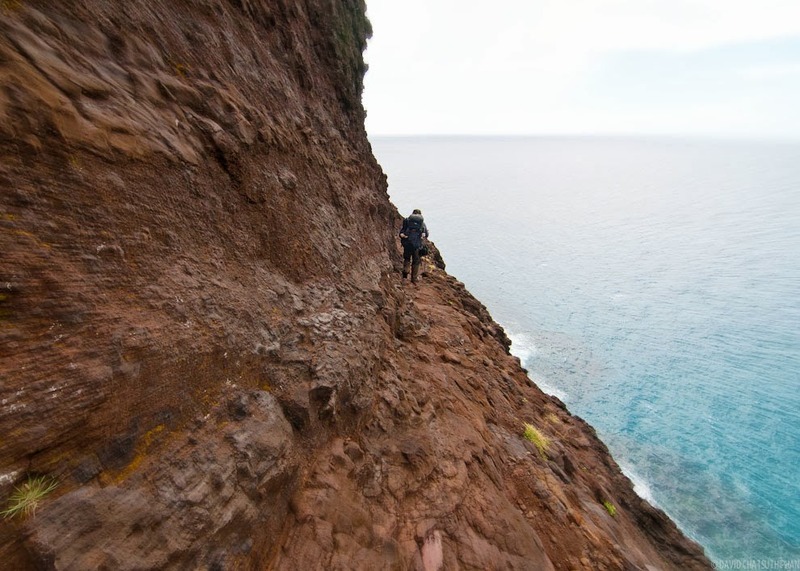 Oddly enough, the cliffs weren't so bad going back, nor was the hike from Kalalau to Hanakoa. Instead the hike from the cliffs to Hanakapi'ai felt like forever and hence no pictures of this during the day. Once we reached Hanakapi'ai, I took of my hiking shoes, picked up the speed, and completed the rest of the hike in slippers. Removing my shoes felt like heaven. My legs no longer felt like jello, my feet no longer sore, and the remainder of the hike was a breeze! Our route, according to my dad's GPS. Even if you're super fit and think you can do the entire hike in 1 day, you probably can, but I highly recommend camping at least 2 nights. The Na Pali coast will probably be one of the most beautiful places you've ever seen and trust me, you'll want to have time to soak in all the beauty. Pack LIGHT. You don't need a 40-50lb bag. You can refill water at the stream. You don't need a sleeping bag.. a sleeping pad and light blanket is more than enough. Bring a bathing suit if you want to swim at Kalalau. Something I wish I did! Get an extra EARLY start. Some parts of the trail were very hot and humid. The parking lot will fill up and it's one road to the trail so traffic can get pretty bad. Plus you get to see the sunrise. We started around 6:30 and I thought that was too late. If I were to do the whole thing again, I would aim for 4:30 or 5am. Hiking poles are super helpful when hiking the cliff part, especially the part heading towards Kalalau. We didn't bring any, but I wish we did. It'll help with the erosion and for me, I can imagine, mentally. On the way back you can face towards the wall so it's not as scary, but on the way way there, it's wide open. 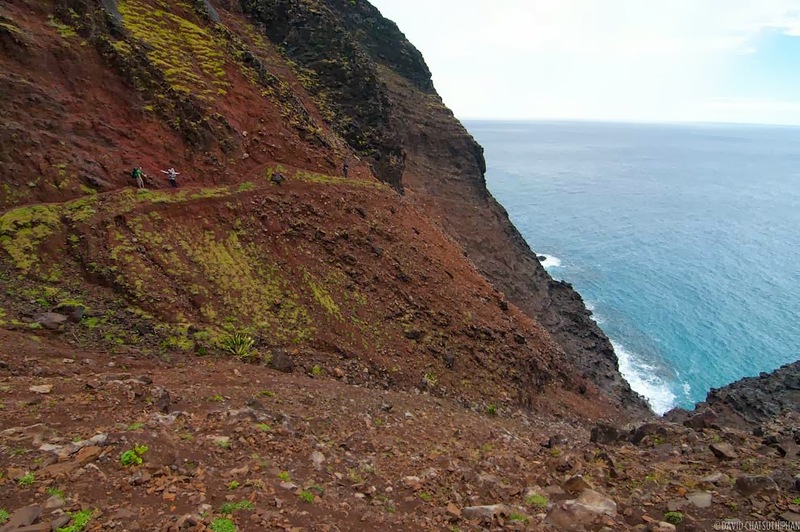 Permits are required to hike after Hanakoa. They sell out 6 months in advance. So I would highly recommend getting them now for the summer. That being said we didn't get our permits checked. We were supposed to do a 17-mile kayak ride the next day, but since the waves were rough, none of the kayaking companies were going out that weekend. Not even the catamarans when out! The Na Pali coast extends way past the hike and the only way to see the rest of it is by boat. In summary, the Kalalau trail is basically hike down to a valley, cross a stream, hike up out of the valley, contour around a cliff, and repeat for the next valley until you've done 11 miles of it. Also during the hike, you have the option to hike to multiple waterfalls further in the valley. We didn't hike to Hanakapi'ai or Hanakoa falls. That'll be in the plan the next time I return. Writing this post makes me want to go back to the Na Pali coast. Literally, mid-way through I went and searched flights and permits for this summer!